So, football’s greatest killjoys are back with a vengeance. Despite offering precisely nothing to the World Cup so far, they once again pop up in the final round of group games like an annoying pustule on your nose on the night of a first date. As they did in Euro 2012 when they knocked out a much more exciting Russia team, they reversed into another fortunate narrow win which was just enough to see them through, eliminating the Ivory Coast. I think we all know what happened. It doesn’t need detailed explanation – it is as anyone who has seen these teams play in this World Cup and previous tournaments would expect: Greece sat deep, Ivory Coast took the possession and attacked, Greece stung them on the counter-attack, and went back to sitting deep. The last minute penalty winner was entirely predictable, as Ivory Coast had retreated after their equaliser, and allowed themselves to be taken advantage of with a blatant dive from Georgios Samaras. The whole thing was entirely predictable. Ivory Coast are culpable too. The truth is, barring a brief spell in the second half of the game against Japan, they have never got it together. They have never found a way of making their talents work in synthesis. In the second half of this game, each player out there wanted to be the hero. On the basis of this performance, they didn’t deserve to go through. But neither did Greece. This cowardly, cynical form of football has never given anyone outside of their country any pleasure. Back in 2004, they won the European Championships having beaten Portugal (twice), France and the Czech Republic and held Spain to a draw along the way. And yet despite the fact that it is theoretically one of the great underdog victories of our time, there was and is no romance about it. There was no one individual to romanticise. They dumped out one talented team after another by playing a style of football that was essentially preventing the other team from winning rather than trying to win it themselves. They didn’t win by being the better team – they won by strangling the life out of the sport. It was the classic example of anti-football, the greatest triumph for the system over the individual since the catenaccio Inter side of the 1960s. Yes, football is about different styles and different tastes, and it was the only way they were ever going to do well in a tournament, but playing this way leaves no satisfaction in hindsight. France, Portugal and the Czech Republic all had a collection of great players, including outstanding attackers like Luis Figo, Cristiano Ronaldo, Zinedine Zidane and Pavel Nedved, but all of them were denied by the Greek wall. In Euro 2012, they were at least taken apart by a ruthless Germany team in the quarter-finals. But this time, they only face Costa Rica, a team they will consider beatable. Win that and they have serious momentum heading into the money rounds of the tournament. Could they…? Surely anyone but the most ardent Greek nationalist could take pleasure from this. At least back in 2004 you could argue that it was the most effective way to use their players. The frustrating thing this time is that they have gifted players in attack. They don’t have to play this way. And yet we all saw what they did to Japan – down to ten men and park the bus. They did show a little more adventure today than they did in the last match, but it was still a variant of the same classic Greek tactic. My bitterness towards Greece is not so much from an Ivory Coast perspective, but from a fan of football. The World Cup, like all sporting events, needs great underdog stories as part of its romantic appeal, but there is also romance in noble defeat. A World Cup with too many underdogs doing well eventually becomes cheapened, leaving a lasting feeling that too many superior teams underperformed rather than that less renowned teams played particularly well. This is especially the case if said underdog does particularly well playing in a joyless, results-driven manner as Greece do. 2002 is often considered a disappointing tournament for this reason – because of South Korea fluking their way past Italy and Spain into the semi-finals, because Turkey also reached the last four, because so many big teams crashed out early on. Thankfully Brazil and Germany saved the day to deliver the final the World Cup needed, and Ronaldo gave us the true romantic narrative of the tournament. Similarly, few recall the 2004 Champions League Final between Porto and Monaco with any particular fondness, aside from fitting into the Jose Mourinho Narrative. The Portsmouth-Cardiff FA Cup Final probably won’t be remembered particularly well outside of fans of those two clubs. No one talks about when Richard Krajicek won Wimbledon, or when Yohan Blake won the World Championship 100m final after Usain Bolt was disqualified. We may talk about about “glamour” as if it is a superficial thing, but having the big name teams and individuals doing well is an important part of how major sporting events are remembered (or not remembered, in some cases). Of course, Ivory Coast going through to face Costa Rica isn’t an enormous step up, but at least they had big name players in Drogba, Yaya Toure and a cast of other stars in what was the most talented of the African squads in Brazil. However, in fairness, they didn’t perform – it would almost have been unjust even if they had gone through too. The ideal solution would have been Colombia progressing alone – none of the other three teams in the group demonstrated enough quality to show that they are amongst the top 16 teams in the world. But that’s tournament football, I guess. A final word on Ivory Coast: Sabri Lamouchi has reportedly announced his resignation already. For once, an African team had held on to a manager far too long instead of sacking him at the first opportunity – he has been a disappointment in charge of this team. The last Ivory Coast manager to coach the team at a World Cup would have been proud of this capitulation. Like Cameroon, Ivory Coast have to get this next appointment right – they probably have enough talent to remain regular qualifiers for Africa Cup of Nations, but this is largely an ageing team, and surely there are now concerns that they may head the same way Cameroon have since losing their great generation of the early 2000s. That late Greek winner was not just about Greece undeservedly scraping into the next round. It was about ending this generation of Ivorian players. We may never see most of these great players at a World Cup again. That’s what hurts. 1. I am an African football fan but this disrespect you are giving to Greece is ridiculous. You say they offered nothing but got four points(the typical qualification tally for CAF sides too). Did you say the same about Ghana 2010, when only a controversial Serbia collapse put them through? 2. There is no moralistic grounds on how football should be played, except abiding by the rules. Your argument about “football fans” which basically means “the majority” is null. Don’t you feel it’s ridiculous to say they knocked out “better teams”. In football, what determines better? Is it circus play- pointless dribbles, fancy passes,etc or the scoreline?? 3. It was a penalty. It is irrelevant to know the intentions of the defender, because the rules are objective cold. He put his leg in the wrong place at the wrong time & at the speed of play the referee observed from, was a foul- which never gets the appreciation it deserves. 4. If you are aware of how the football trajectory has been moving- then you know the “weaker countriess” now enjoy almost the same player preparation, education & support the traditional powers always did. The line is being blurred so this entitlement about the “cheapening” belongs in a previous era. 5. 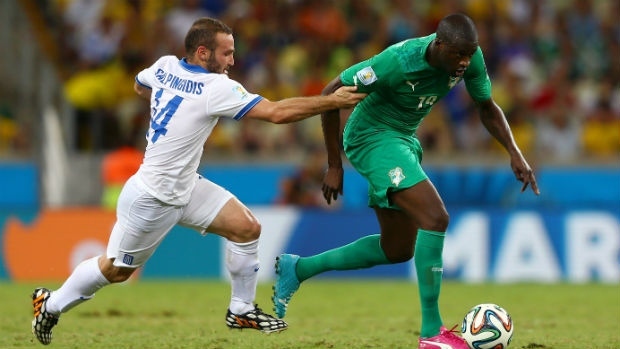 Instead of crying for Ivory Coast, Africa should take responsibility & ask itself questions. Why, has there been a real improvement since 1990? Why are quarter final runs a shock? Why can’t African qualifiers make the r16 in two games? Why is it always the nerve wracking, calculator requiring 4 points? 6. What hurts, is this lack of responsibilty. Ivory Coast starry generation flopped at the peak of their powers, now it was about the “last-drop-of-the-juice” which didn’t prove enough so this remorse is illogical. As a Greek, this post extremely comical. Thanks for the laughs I had throughout! I agree that Greece doesn’t play an attractive style of football, but do you remember the movie “White Men Can’t Jump”? What was Sydney and Billy’s argument during the entire movie- would you rather look good first and win second, or would you prefer to win first and look good second? Greece has come a long way in their football development. Within 10 years, we have had a Euro Cup in 2004, 2010 World Cup qualification, 2012 Euro Cup Quarterfinalist and 2014 Round of 16. Regardless, that is better than most other European nations outside of Spain, Italy and Germany. I hope you write something similar for when Costa Rica falls victim to the anti-football Greek side !!! I will be ready for another laugh! This piece is not only ridiculous, it is damaging to the name of Sandals for Goalposts, usually such a professional, insightful title. Very disappointing.